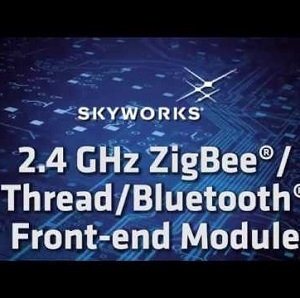 Skyworks has introduced a new 2.4 GHz fully-integrated RF front-end module (FEM) the SKY66403-11, designed to support ZigBee, Thread and next-generation Bluetooth wireless protocols (including Bluetooth Low Energy “BLE”). This high-performance device is designed for ease of use and maximum flexibility for Internet of Things (IoT) applications, particularly within the connected home, wearables and M2M markets. This module is also suitable for coin cell battery devices, security and environmental sensors, wireless audio platforms, in-home appliances, smart thermostats and lighting systems. The FEM features an integrated power amplifier with up to 21 dBm output power and operates over a wide supply voltage range (from 1.8 to 3.6 V). It also includes LNA and antenna diversity switching for all modes and comes in a compact multichip module package (22-pin, 3.5 x 3.0 x 1.0 mm). This device extends range up to 4X when compared to standalone system-on-chip (SoC) solutions. To learn more about the SKY66403-11, click here.